1) Support for Mac from the "Window > Combine Windows" menu. You can save the report to a Data Table if you only need to reproduce the report using the same table. If you want to automate the process for another table, you can create an Add-In. This will create a menu item that you can invoke against any data table. The name of the menu item can be specified when saving the Add-In. As described, this approach works when the analysis will always be done on the same columns. There are additional steps that you could take to further customize the layout and workflow of the application through the "Edit Application" menu item above. Did you know that starting in JMP 10, you can easily combine multiple reports associated with a data table into a single report window without writing a JMP script? 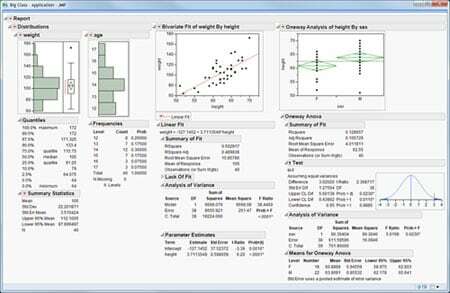 Suppose you have produced multiple analyses and graphs, and would like to display the results in one window. If you put the reports in a JMP journal, you lose the interactivity between the reports and the data table. To maintain this interactivity, use the new combining feature. First, open Big Class.jmp from the Sample Data folder. Click the red triangles next toDistribution, Bivariate and Oneway in the Table panel, and select Run Script for each to produce three reports. Arrange the reports on your desktop as you would like them to be arranged in the combined window; both simple horizontal or vertical layouts are supported. Check the box in the lower-right corner of each report. Click the downward pointing triangle next to the check box in any of the windows and selectCombine selected windows. The three reports are combined in a single report window that is still linked to the data table! Clicking the red triangle next to Report displays a menu with several options. In the script submenu, there are familiar commands for saving a script to recreate the report. The Edit Application command opens the report in the Application Builder, which is also new in JMP 10, for further editing or customization. Note: You can also combine selected windows from the Window -> Arrange submenu, or by selecting the reports in the JMP Home window, right-clicking on them, and selectingCombine. You can learn more about this topic in our course Application Development Using the JMP Scripting Language. This tip was provided by Monica Beals, JMP instructor. Thanks Dan and LouV the tip was of great help.